Members of Southern State Cancer Crusaders accept donations from Delta Kappa Gamma honorary society toward the Kare Kits project. Shown from left to right are Michelle Meddock, Angie Moots, Joy Gilmore, Rainee Angles and Becky Storer. Southern State Community College’s Relay for Life fundraising team, the Southern State Cancer Crusaders, is collecting items for the creation of “Kare Kits” — care packages to be given to patients undergoing treatment for cancer. 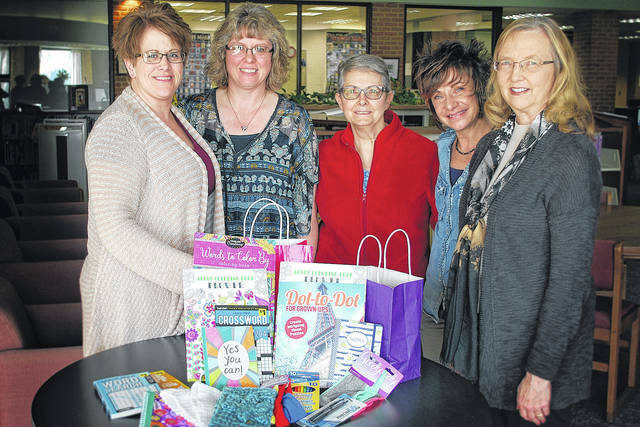 The local team recently received a donation of care items from the Alpha Chi chapter of Delta Kappa Gamma, an honorary society for outstanding women educators. The DKG donation was organized by members Becky Storer and Joy Gilmore. Southern State Cancer Crusaders is accepting the following new items, including: water bottles, snacks, gum/candy, lip balm, lotion, magazines, novels, sketch pads, journals, activity books, thank-you cards, writing utensils, headbands, hats, bandanas, socks, playing cards, travel games, stuffed animals, small toys, dolls, children’s books and more. Those interested in donating to the project, or in requesting a Kare Kits care package, can visit www.sscc.edu/students/events/relay-for-life.shtml for more information.